There are many issues of Alzheimer’s disease that are extremely challenging for a family caregiver. One of the most difficult, however, is anosognosia. This condition is when your elderly loved one is not aware of their Alzheimer’s disease and how it is impacting their health and function. This is not denial or avoidance, but rather a true unawareness of the condition and what they are going through. When this happens your aging loved one does not know what they are facing, and therefore does not understand the care efforts that you are trying to put forth for them. This can present a tremendous challenge to you and make it difficult for you to handle your care plan in the way that you know will give them the care, support, and assistance necessary for them to stay healthy, safe, and comfortable. Focus on safety. The most important focus of your care for your loved one should be keeping them safe. 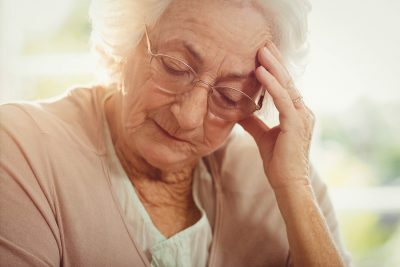 The cognitive changes that come along with Alzheimer’s disease can make it so that your loved one is at risk of dangerous situations throughout their home. It is important that you focus your care on reducing these risks and helping prevent potentially dangerous decisions. This can include disengaging the oven so that they cannot turn it on and forget it, storing sharp and otherwise dangerous items out of reach, and establishing consistent care for them. Create a schedule. Your elderly loved one will not understand why they need the assistance that you are trying to give them when they are not aware of the condition they are facing, but they can still be overwhelmed by tasks. Rather than giving them a long list of everything that has to be done, create a schedule to recommend what order you should perform tasks. For example, rather than saying “we have so much to do” and listing off the tasks, tell them which order you will handle the first few tasks and then add in something enjoyable for you to do together. Complete those tasks, and then create a schedule for the next few. If your aging parent is suffering from Alzheimer’s disease, now may be the ideal time for you to consider starting home care for them. The highly personalized services of an in-home senior health care services provider can help your aging loved one manage their symptoms and limitations in a way that is tailored specifically to their personality, lifestyle, and goals so that they can live the highest quality of life possible while also maintaining more independence and activity. If your parent is also dealing with anosognosia, this care provider can make a tremendous difference in your parent’s mental health, supporting them and encouraging them to continue taking care of themselves in an appropriate way as they work toward greater awareness of what is happening to them. If you or an aging loved one are considering home care in Manalapan Township, NJ, please contact the caring staff at Lares Home Care 888-492-3538 or 732-566-1112.